The island of Puerto Rico was one of four territories surrendered by Spain after the Spanish-American War of 1898. Cuba gained its independence, but Puerto Rico, Guam and the Philippines became possessions of the United States. Puerto Rico's first railways were built in the 19th century under Spanish rule and generally used European and British equipment. 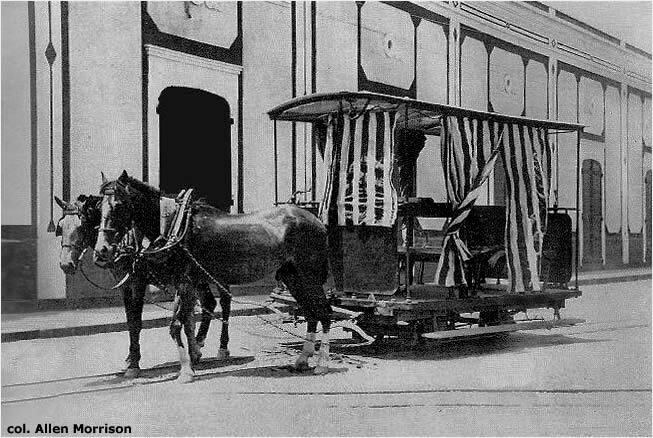 Its first public line – the first railway of any kind in Puerto Rico – was the horsedrawn tramway that began carrying passengers along Calle Méndez Vigo in Mayagüez in 1875. 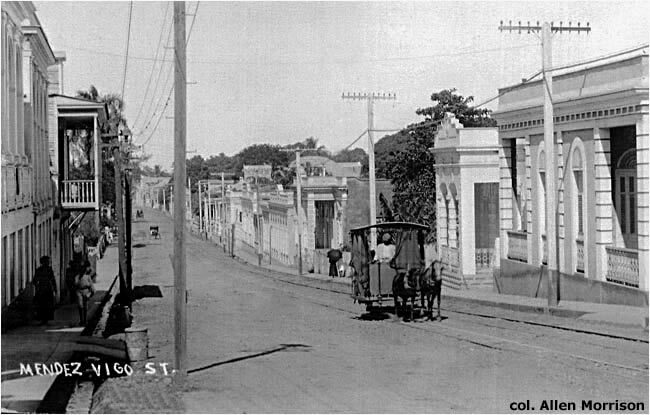 The street railways in San Juan and Ponce opened in 1880. The first section of the island's 475 km circumferential railroad did not start service until 1891. 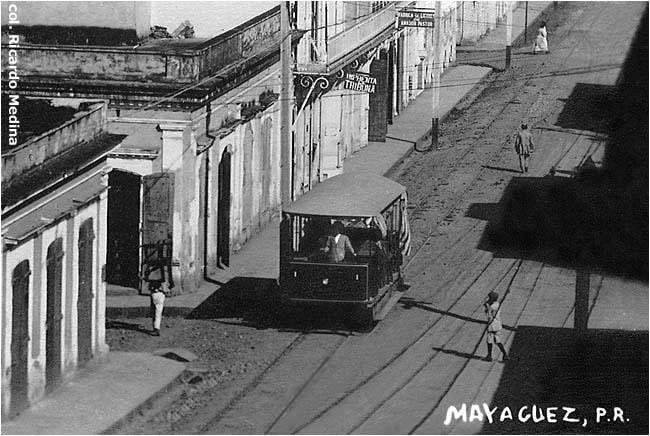 Mayagüez had three different tramway systems between 1875 and 1926. Counting the lines on Mona Island, which is considered a barrio of Mayagüez, there were actually four systems. Each system had its own fleet of vehicles and each system used a different track gauge. According to a 1919 Informe [see BIBLIOGRAPHY], Ferrocarril Urbano de la Villa de Mayagüez began carrying passengers along Calle Méndez Vigo, between Plaza Colón (Calle Peral) and a depot at Calle Comercio, on 27 February 1875 [see map]. (Mayagüez was promoted from villa to ciudad in 1877.) 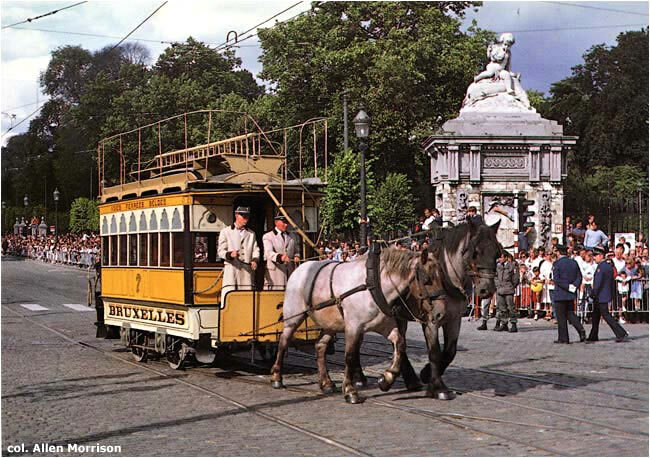 The city's first tramway was 1.47 km long and used a track gauge of 1450 mm or 57 inches, similar to that used in Madrid and Barcelona. FUVM received permission on 19 June 1878 to replace its horses with steam locomotives, but it is not known if this happened. The line closed on 3 February 1886. 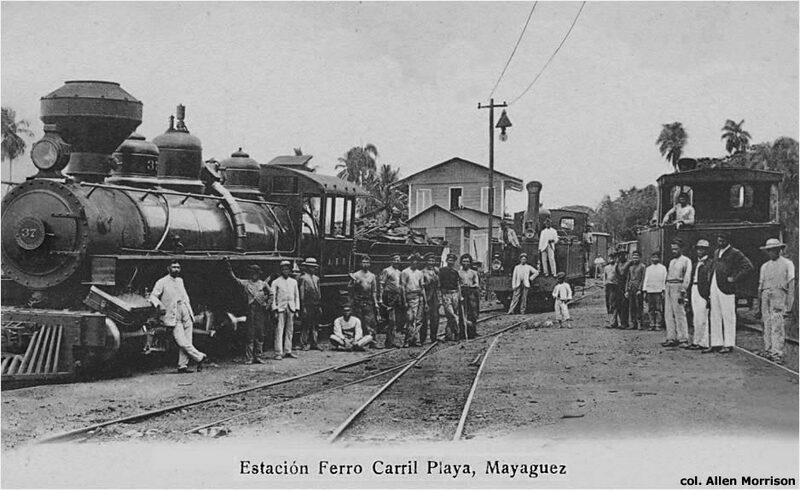 Six years later, in 1892, Ferrocarriles de Puerto Rico ran its first steam-powered passenger train between Mayagüez and Aguadilla, 44 km to the north. The 55-km section of the railroad from Mayagüez south to Yauco did not open until 1903 and the entire 187-km route from Mayagüez to San Juan was not completed until 1907. Ferrocarriles de Puerto Rico was renamed American Railroad Co. of Puerto Rico ("ARR") in 1902. In 1893 two local engineers, Joaquín Gisbert and Guillermo Quintanilla, proposed a new narrow-gauge tramway system that would duplicate the 1875 line along Calle Méndez Vigo, loop around streets in the city center and extend west over the Río Yagüez to the docks and the Playa station of the ARR. [The map of their proposed system is noted in the BIBLIOGRAPHY.] 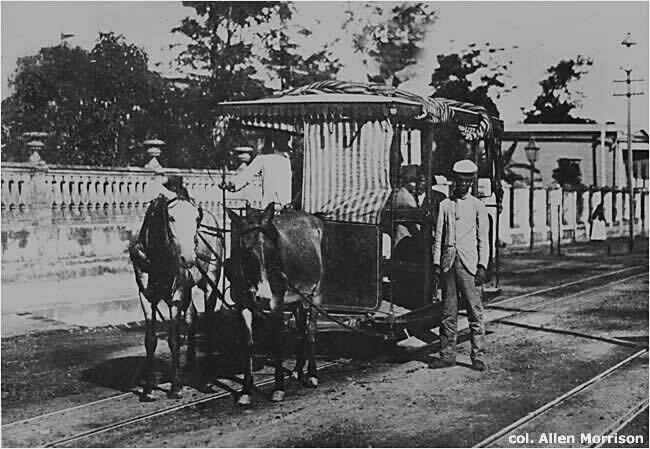 The contract for the Sociedad Anónima Tranvía de Mayagüez was signed on 22 August 1894, construction began and the first section of the city's second tram line, 1.5 km long, along Calle Méndez Vigo from Calle Peral to a new tram depot across the river on Calle Concordia, was inaugurated on 28 May 1895 [see map]. Track gauge this time was 610 mm or 24 inches. The 1918 and 1924 editions of the McGraw Electric Railway Directory [see BIBLIOGRAPHY] state that Mayagüez had four battery trams. The source of the fourth vehicle is unknown, and it is also not certain whether it was built before or after the three Jackson & Sharp cars. Order lists of U.S. tram builders show no other orders for Mayagüez. 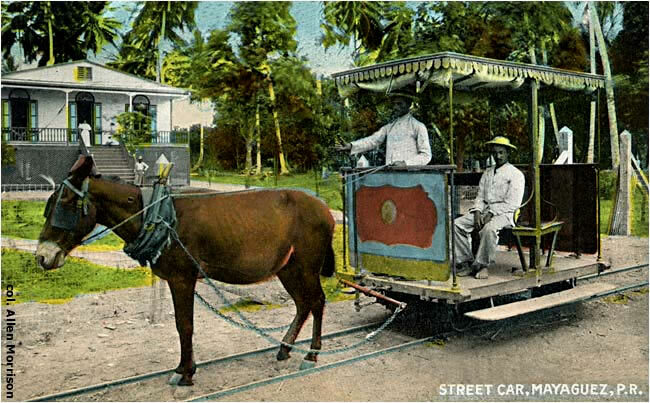 Between 1912 and 1917 the Jackson & Sharp Co., J. G. Brill Co. and St. Louis Car Co. in the United States built dozens of battery-powered trams for Maracaibo, Venezuela, and several cities in Cuba. 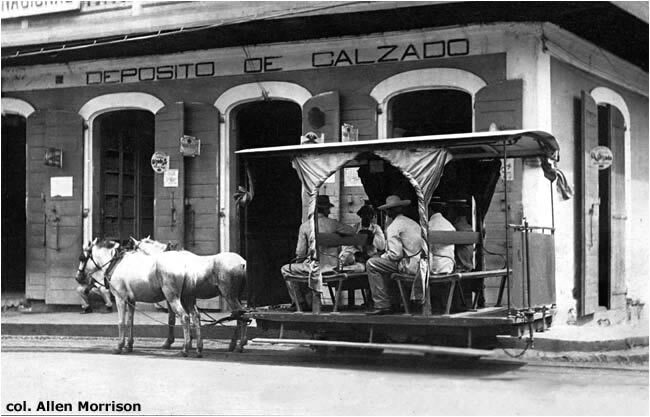 It is possible that the fourth Mayagüez car was acquired as surplus from one of those orders. 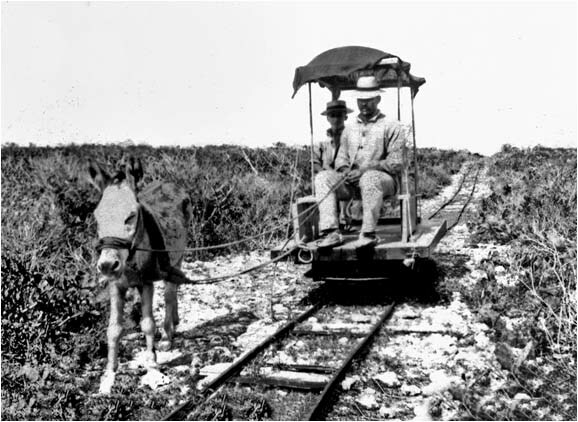 In addition to the street railways and the American Railroad line, the Central Rochelaise 4 km south of Mayagüez operated 4.3 miles (7 km) of railway around its sugar plantation. Its lines are still shown on a topographical map published in 1947 [see BIBLIOGRAPHY]. The ARR was reorganized that year as Puerto Rico Railroad & Transport Co. It discontinued passenger service in 1953 and ended all rail operations in 1957. Ilustración Española y Americana. Madrid, 1857-1921. Spain's early picture magazine. 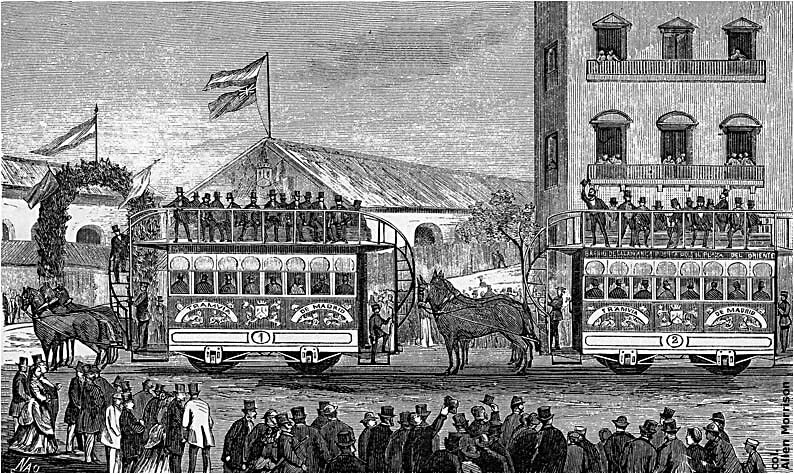 An article on p. 267 of the 5 June 1871 edition describes the inauguration of the Madrid tramway on 31 May. The cover of the 15 June 1871 edition, p. 281, features the illustration reproduced at the top of this page. Text on p. 283. Unfortunately no mention of the Mayagüez tramway could be found on any page of the editions published between 1871 and 1876. Doctor Franck. La Enlutada del Tranvía: Escenas de la Vida Interior. 94 pages, Mayagüez, 1889. 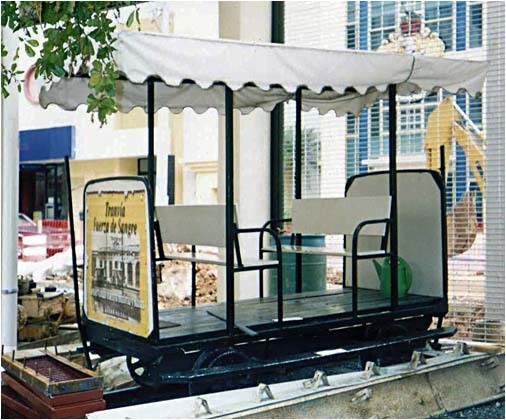 Memories of the author's trips on Mayagüez trams. "Proyecto de tranvía en Mayagüez (Pto Rico). Plano de detalle del trazado por las calles que cruza. Escala de 1:2000 metros. 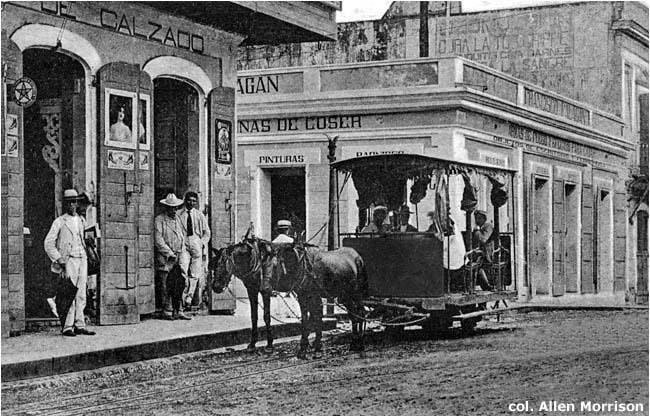 Mayagüez, 11 Febrero 1893." (Located in Archivo General de Puerto Rico. Fondo: Obras Públicas. Serie: Ferrocarriles. Legajo: 106. Caja: 170.) Extremely detailed, large-scale track map of the proposed second tramway system. Only about 2/3 of the lines shown were built. José de Olivares. Our Islands and Their People As Seen with Camera and Pencil. St. Louis [et al. ], 1899. There is an aerial view of a closed tram in Mayagüez on p. 359 of volume 1. It is reproduced above. McGraw Electric Railway Manual / List / Directory (title varies). New York, 1913-1932. Corporate data, finances, physical description, technical data for thousands of lines in North America and the West Indies. The 1918 and 1924 editions were consulted for information on Mayagüez. Philip S. Smith. "Electrical Goods in Porto Rico [sic]" in U.S. Department of Commerce, Bureau of Foreign & Domestic Commerce, Special Agents Series #134. Washington, 1917. A section on Steam and Electric Railroads on pp. 12-13 notes 5 cars operating on 3 miles of track on the Mayagüez storage-battery line. It is believed that the figure of 5 cars was a mistake. Puerto Rico. Departamento del Interior. Informe del Comisionado, 1919. San Juan, 1919. An article labeled "Ferrocarriles y Tranvías. Resumen Histórico. 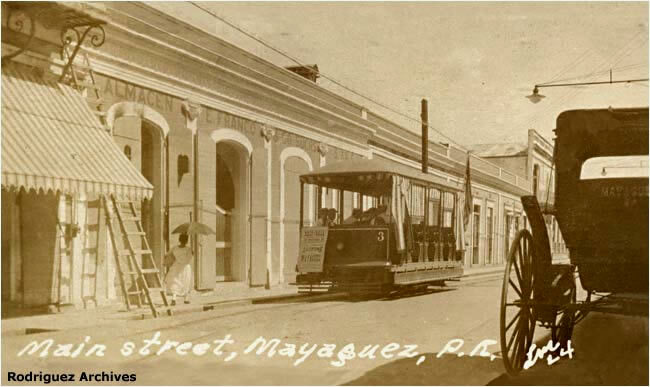 Tranvía de Mayagüez" on p. 130 says that the first tramway opened on 27 February 1875 and used 1.47 km of double track of 1450 mm gauge. Says the franchise expired on 3 February 1887 after the line had not run for a year. 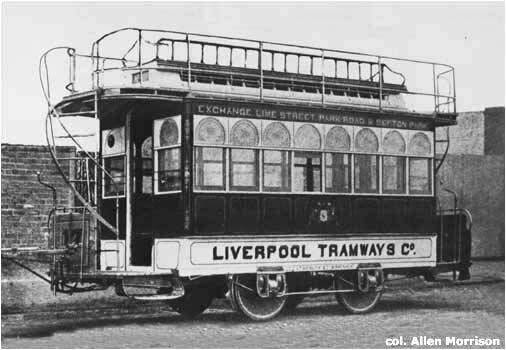 The article does not mention the second tramway of 1895, but says a franchise for the third, the electric line, was awarded on 30 December 1913 and its length was 2.4 km. W. Rodney Long. "Railways of Central America and the West Indies" in Department of Commerce, Bureau of Foreign & Domestic Commerce, Trade Promotion Series #5. Washington, 1925. The Porto Rico [sic] section on pp. 336-358 describes development of the ARR and the plantation railways, but says nothing of the Mayagüez tramway. U.S. Department of the Interior. Geological Survey. Puerto Rico, "Mayagüez Quadrangle". Washington, 1947 [map surveyed 1938-1939]. Topographical map, scale 1:30,000. Nice detail of city streets and American Railroad line and yards. Also shows rail network at the Central Rochelaise plantation south of town. Lidio Cruz Monclova. Historia de Puerto Rico (Siglo XIX). Tomo 2, Primera Parte (1868-1874). Río Piedras, various printings 1952-1964. 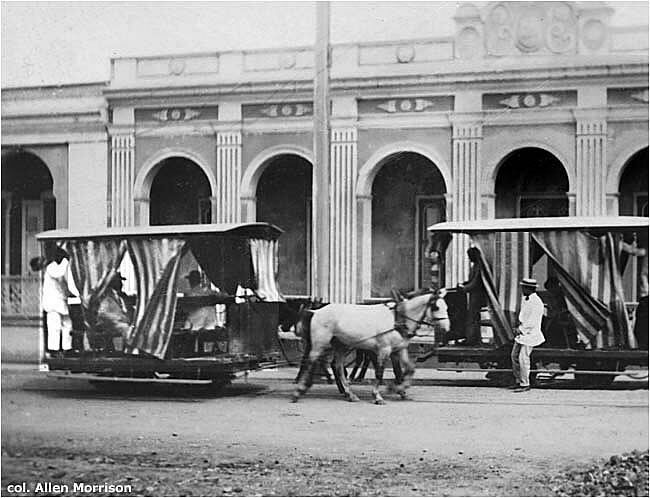 Referencing articles in several 1872 editions of the Mayagüez newspaper La Razón, the author states that "el 18 de marzo de 1872 ... se inauguraba en Mayaguez [sic] el primer ferrocarril de sangre para la transportación de pasajeros" (p. 245). Why he wrote "inauguraba" (was inaugurating) and not "inauguró" (inaugurated) is unclear. Martín Gaudier. Genealogías, biografías y historia del Mayagüez de ayer y hoy. 493 pages, San Juan, 1959. 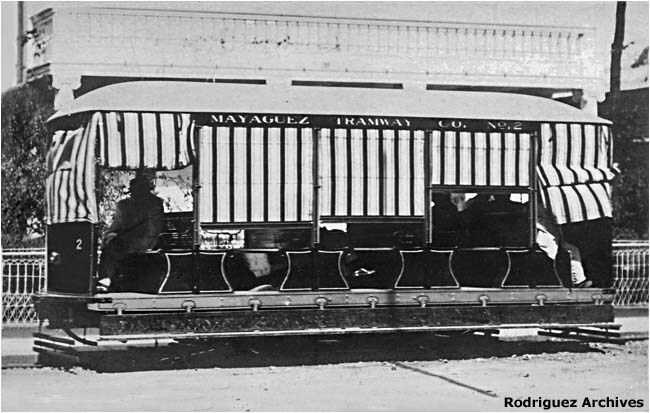 A paragraph entitled "El Tranvía de Mayagüez" on p. 17 briefly mentions the 1895 tramway. The author says nothing about the earlier line or the later electric line. 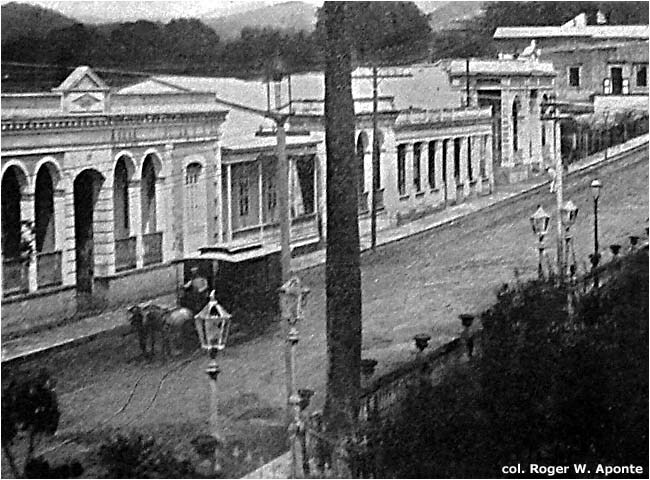 R. Rosas, Jr. "Historia del Tranvía de Mayagüez 1893" in Revista Anuario. Mayagüez, 1967. Good information about the second tramway of 1895. 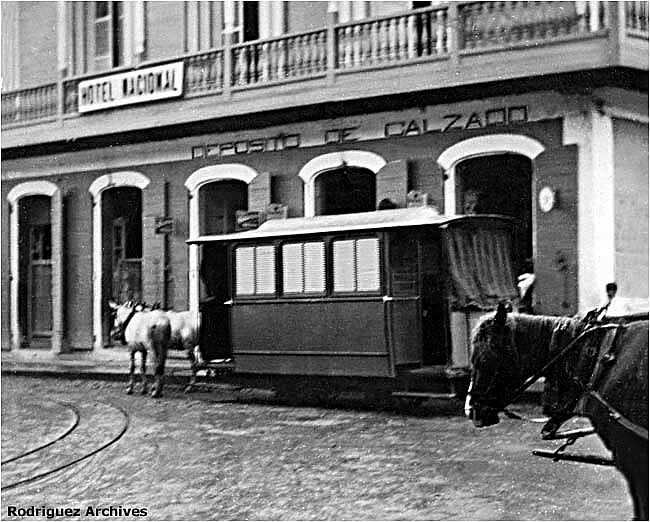 Says that "para el año 1927" (around 1927) a corporation called Javierre & Cía introduced a battery tram, but it couldn't maneuver the grade on Calle Méndez Vigo so was withdrawn after a few years . . .
Ernesto Vázquez-Torres. Estampas de Mayagüez. Hato Rey (Puerto Rico), 1981. A collection of essays. "Los Tranvías – Pioneros de la Transportación en Masa", pp. 12-15. This brief historical survey implies that a single tramway system operated from 1871 until the 1920s. Efraín Archilla-Diez. Catálogo Numismático de Puerto Rico / Numismatic Catalog of Puerto Rico. Vol. 1. San Juan, 1990. 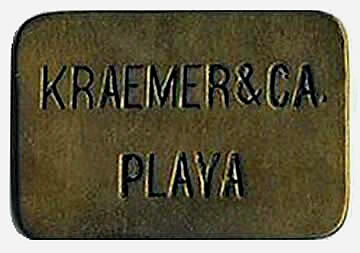 Illustrations of the "Kraemer & Ca." tokens pp. 237-238. Manuel Durán-Durán. Mayagüez en el tiempo y el espacio: 1918-1991. Mayagüez, n.d. . Photo album, mostly views taken after the 1918 earthquake (Richter 7.5). Several fascinating views of tramway and ARR railroad tracks in the pavement. Adolfo de Hostos. Tesauro de Datos Históricos. Tomo III, Río Piedras, 1992. The "Ferrocarril" paragraph on p. 698 provides valuable tramway data. Manuel Durán-Durán. El Tranvía de Mayagüez. Primer Ferrocarril Urbano de Puerto Rico. 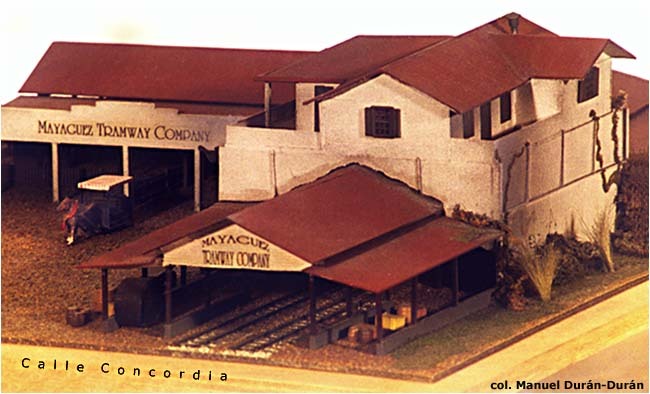 Fundación Nuevo Mayagüez, Mayagüez, 1995. An attractive 4-page pamphlet with text, five illustrations and reproduction of a map of the 1875 line. Excellent, concise survey of the city's tramway development. University of Puerto Rico Mayagüez Campus. Department of Geology. Mona Island. History of Man and Mona Island. A section on "The Mining Period" notes ". . . a rail tramway up a 50° slope to a cave, a stairway through the cave, and then another 6,000 feet [1.8 km] by tramcar subject to frequent derailment because the 22-year-old tramway was in a state of collapse . . . 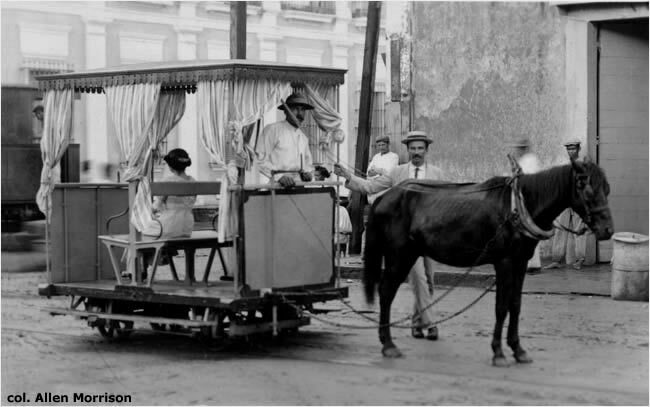 In 1925, the tramcar with a canopy on top, was drawn by Macario, a 'disdainful' burro. The construction of an automobile road was underway by 1927." Roger W. Aponte. Railroads of Puerto Rico/Ferrocarriles de Puerto Rico. Elaborate bilingual website with history, maps, photographs, articles, timetables, etc., of every railroad and tramway, past and present, that exists or is known to have existed on the island. Highly recommended. Archivo Histórico y Fotográfico de Puerto Rico - Colección Rodríguez / Historical Ephemera and Photographic Images of Puerto Rico from the Rodríguez Archives Collection. Extraordinary assemblage of historic material, photographs, postcards and other documents, indexed and cross-indexed by subject and locale. Recommended highly. Three of the postcard views are reproduced on this page. The author wishes to express his gratitude to Manuel Durán-Durán of Mayagüez, Roger W. Aponte of Ponce, and Jose and Fred Rodriguez of the United States for their generous assistance in the preparation of this page.